Bo Bichette seems to have mastered the postseason in his second shot. After going 1-for-11 for Class A Advanced Dunedin last year, Bichette has seven hits in his first eight at-bats this postseason. He went 3-for-3 with a walk and was hit by a pitch for a perfect night at the dish Thursday, scoring four times as New Hampshire drubbed Trenton, 10-3, in Game 2 of the Eastern League semifinals at Northeast Delta Dental Stadium. "Being aggressive and being athletic, I think I got away a bit from that this year," the 6-foot, 200-pound infielder told MiLB.com in July. "Recently, I've been trying just to kind of let myself be free, just trying to hit the ball and don't worry about mechanics." 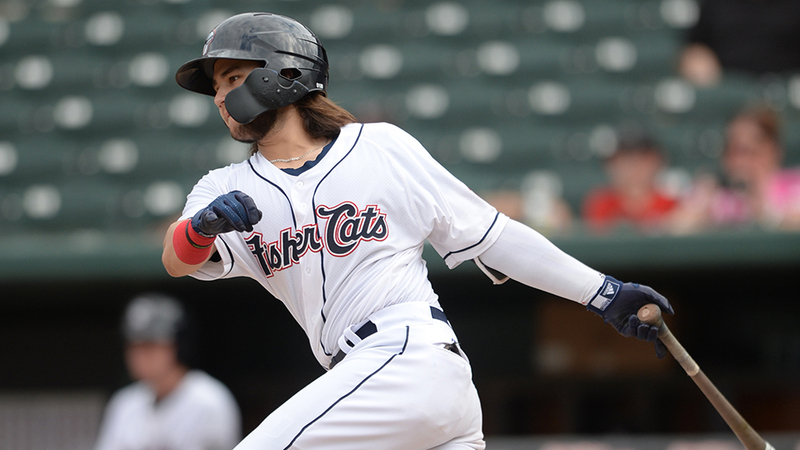 The Fisher Cats can sweep the best-of-5 semifinal with a win in Game 3 on Friday night at Trenton, with Jordan Romano facing Nick Nelson, the Yankees' No. 18 prospect. Max Pentecost, the 11th overall pick in the 2014 Draft, hit a three-run homer in the first inning, and Harold Ramirez tripled home a pair in the second. Bichette scored after singling each time. No. 9 Toronto prospect Cavan Biggio added a two-run single in the sixth and Josh Palacios capped New Hampshire's scoring with a bases-loaded triple in the eighth. Dom Thompson-Williams, who had a breakout season between Class A Charleston and Class A Advanced Tampa, belted a two-run homer and Gosuke Katoh added a solo shot for the Thunder. Tayler Saucedo allowed one hit and a walk in 3 2/3 innings to earn the win in his first relief appearance for the Fisher Cats after 11 starts. "I didn't know the extent of my role," Saucedo said on the team's postgame show. "I knew I was going to come in for lefties. I just knew I had to do a job for however long. ... My goal was just to have them beat me. I wanted to induce contact, get a lot of ground balls and hand the ball to the bullpen. We feel great to be in this spot [up two games to none]." Nick Green allowed five runs on six hits in 1 2/3 innings to suffer the loss.